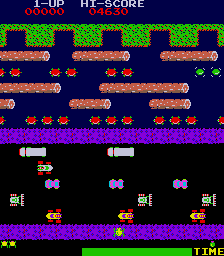 Frogger is one of those games that is so easy to learn, yet you end up spending far too much time peeling yourself off car tyres than you think you should. You have to navigate your frog across busy traffic and then leap from log to log across a river, all the time avoiding various unpleasantries. If it's not a car or a truck that's out to get you, it's a crocodile!